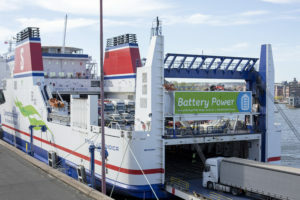 The Stena Jutlandica has completed its first month of operation as a battery hybrid vessel on the Gothenburg-Frederikshavn route. In the first stage of test, electric power is being used for manoeuvring in port. The second stage will be to run on electrical power for about ten nautical miles. In the third stage it is planned to use the electric motors to cover the 50 nautical miles between Sweden and Denmark. “It’s really exciting to be running with electrical power on the Stena Jutlandica. This project is an important part of our focused efforts to find ways of reducing our impact on the environment. As both the size and cost of batteries decrease, battery operation is becoming a very attractive alternative to traditional fuel for shipping since emissions should be possible to completely eliminate in the future,” says Erik Lewenhaupt, head of sustainability at Stena Line.